Vision board workshops are a great way to be inspired and work on your goals. Great question! I remember doing them in school, do you? My class cut out grandiose pictures of mansions and fancy cars with high power people standing next to them. We announced to the world what we wished for and therefore we could just expect it. Right? Frankly, I always hated making those boards! Even as a 5th grader I thought they were ridiculous because I felt it was a huge lie. I looked at my family and knew that having a mansion, expensive cars, being tall and gorgeous AND having a great job were one in a trillion. Not that I thought less of myself, I thought it of everyone in my class. If it were that easy, everyone would do it. Therefore, it must be very difficult and that lessened the odds. I also knew that as one of nine children from a blue collar family that had attended a new school every semester my whole school career, it just didn’t seem likely. I was shy and awkward and had zero knowledge of the professional world, investing, money or how to manage a business. I tell you all of this because I had an epiphany recently. We go after what we focus on. Tada! There you go. My great knowledge of 2017. 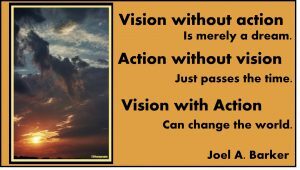 When I’m working towards something I meditate on what I want, I focus, think about, plan, look for it and I work towards it. A vision board didn’t make sense. I thought of it as putting pretty pictures on a large, ugly poster board and writing fancy dreams all over it and then sticking it in a closet somewhere. Here’s an example of what I’m talking about. I’ve always wanted to build a house. I planned for it in my head in general terms. I wanted a small house with many windows that overlooked a corner log. When the nudge came to start looking; I did! We built a house in a quiet little neighborhood. I kept the image in my head and when I thought about building a house, I would bring it out and daydream about it. WOW – BOOM! There it is. That’s the why of a vision board. It’s not to dream silly, but to plan and act on what we actually want and that’s the piece I was missing all these years. Sitting here writing this I had a vision come into my head of someone in a flat bottomed boat pulling on a rope tied to the shore. They are trying to cross a muddy bog so they pull on the rope and get a little closer to shore. Pull again and get a little closer. That’s me now. I see the shore and move towards it a little each day by focusing on what I want and SEEING it. Same vision transitioned to me sitting in the same boat, but waiting for the wind and what little water there was to move me towards the shore. UGHHH How silly I feel. The whole time all I had to do was pick up the rope! Now to the fun part of this post. I learned a great lesson and now I want to share my enthusiasm and energy with all of you! I’m hosting a vision board workshop. Anyone is welcome to join, just go to the link below and it will take you right to my free group. Click on events and click going. It’s that simple. I will post to the event different encouraging ideas and reminders. 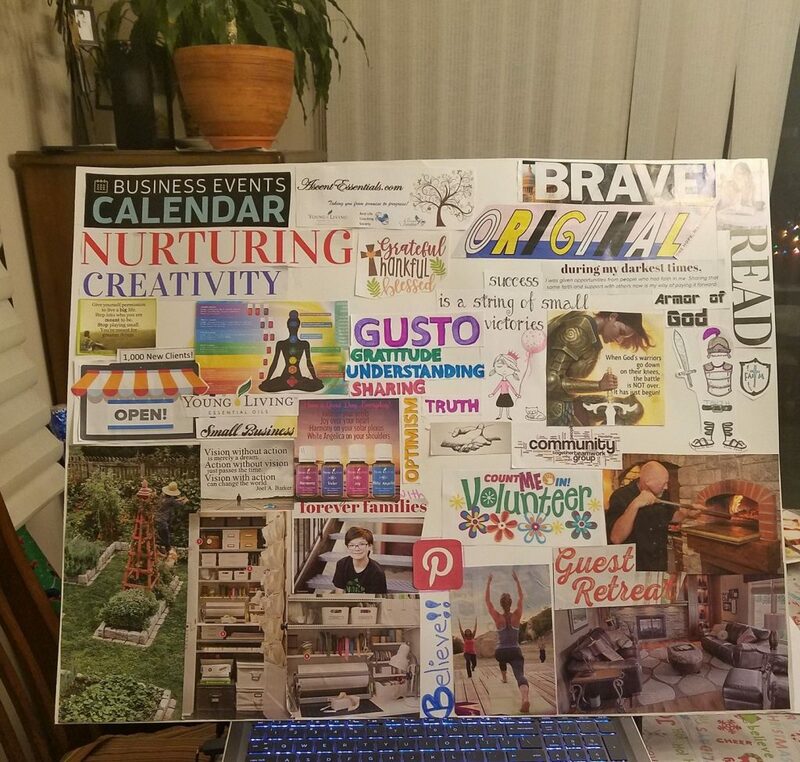 Then the night of the event I’ll turn on my webcam and we’ll walk through everything I’ve learned and create our very own vision board full of love and encouragement and possibility! I’m writing a workshop, goal finding activity and will be posting fun memes, quotes and ideas the whole week! To get the goal finding worksheet simply go to scrapwithme.com and post on the wall that you’d like a copy.